Patrick and JB talk monsters, models and J.J. Abrams' Super 8, plus receive a special surprise visit from the supervillain known only as THE QUIBBLER. JB was on fire in this episode! This is a classic podcast about a good movie. 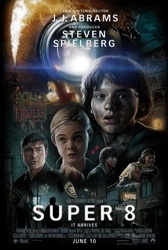 Super 8 strikes me as the product of an emerging talent with several very good ideas, but he was/is still at a stage of emulating other film-makers. The movie could have used a lighter touch in some spots, but overall it was quite enjoyable. And I agree that Elle Fanning's performance was remarkable. Over the past few weeks I've been thinking about a question raised in this podcast: should a (good) movie be viewed multiple times before making firm conclusions about it? I would say, yes, whenever possible (realizing that practical limitations might intervene frequently).